I've always found myself more comfortable on the margins of Conventional Wisdom critiquing it rather than on the inside articulating it. Which is why I've been fascinated by the writings of the so-called 'climate skeptics' for a number of years now. They've had an awfully bad run in the main stream media, and thus not too many people read their books. But Professors Ian Plimer and Bob Carter - both geologists - have written excellent and challenging books, as has Nigel Lawson, former British Chancellor of the Exchequer. 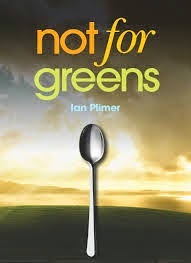 Plimer's just released Not for Greens is another of his trademark hard-hitting, passionate, take no prisoners offerings. His voice is that of an old curmudgeon banging remorselessly on about the larger truths in the climate debate - larger, more important insights, fed by geology. According to climate scientists Plimer is a 'denier' from a parallel universe. But for a boy from Broken Hill like me, whose father spent his entire working life underground, that universe is a far richer and more intellectually satisfying place than the visions of apocalypse manufactured by today's climate alarmists. Plimer is a natural born polemicist. He writes with verve, wit and frequent unremitting savagery. He's always pungent and spares the reader no technical detail in getting his message across. The book demands your concentration. The energy chapter for example is superb, and worth buying the book for alone. He's simply excellent on the deplorable economics of renewable energy sources such as wind farms, solar and biomass; And his explanation of how fracking works, its economic importance, and the politics around it is fascinating and persuasive. But unfortunately the book has so many weaknesses it's hard to know where to start. Firstly, Plimer would get far more traction and credibility if he stopped talking exclusively to old white men, and accepted the challenge to talk to younger people. His extreme cartooning of the Greens for example is a real turn-off. It's low rent and embarrassing. On virtually every page he resorts to stuff like this: 'The great thing about an underground mine is that it is a green-free zone' (p230). And possibly gay-free as well? Any decent publisher would have cut this rubbish out. The book has a stupid title and a totally meaningless subtitle. The blurb on the back cover is woefully inadequate and was obviously written by the author himself - always a bad thing. It gives no hint as to the real substance of the book. Typically, for so many Australian books these days, there is no author photo, no index and the copy editing is shameful. It's also been badly (if at all) proofread. In other words it's been put together by rank amateurs. (Dear editor: it is quite commonly accepted in Australia these days that 1000 million is one billion. So the earth is 4.5 billion years old, not '4500 million'. This dated editorial style irritates all the way through the book). There are too many manufacturing and chemical details re iron and steel production down the years that are simply not key to the book. A good editor would have chopped this. There's no need for the reader to be informed in detail about the Bessemer process of steel making, how magnesium oxide is made, or how nickel sulfides are mined. This is a series of lectures from Mining 101 and they go on and on and the students are asleep at their desks. However Plimer's enthusiasm for mining is infectious and he does succeed in conveying the enormous complexity that mining operations involve. We're not just a quarry, just 'digging up and shipping stuff out'. I've read all of Plimer's stuff over the years, so I'm used to his cantankerous style, but I've little doubt that most readers will be thoroughly put off. If one of these days he could get himself a mainstream quality publisher who could manage his wayward emotional outbursts and discipline him to focus more clearly on the gentle art of persuasion he could do himself and a much wider public a great service. Agree. He doesn't like editing for obvious reasons but a little light editing wouldn't do any harm. The biggest problem with his writing is that it doesn't flow, it jumps around incoherently at times, which is a bigger issue. But the broadness of knowledge is the best part, even if it isn't always well argued.